The Florida Wildflower Foundation provides scholarships for master’s students studying wildflowers within the University of Florida’s Plant Restoration and Conservation Horticulture Consortium of the Department of Environmental Horticulture in Gainesville. Scholarship students are advised by Dr. Hector Perez, associate professor. Luis Andres Ochoa studies Sand flax (Linum arenicola). 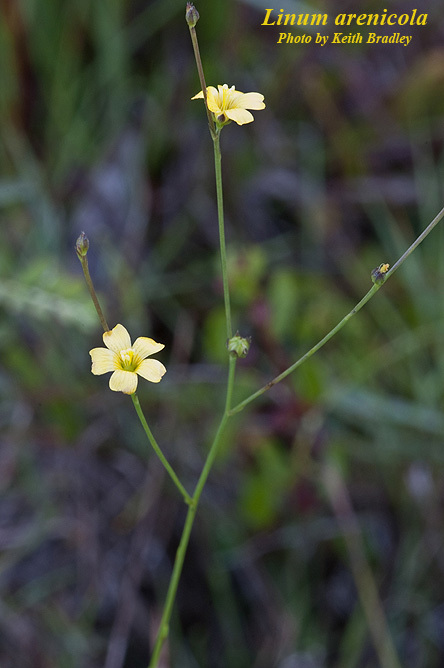 Sand flax is one of nine Linum species occurring in Florida. It is a perennial with a small yellow flower and grasslike leaves. It blooms in spring and prefers pine rockland or rockland hammock habitat. Populations that exist on roadsides face extinction from mowing, herbicide damage and hurricane storm damage. Sand flax is endemic to South Florida and is listed as an endangered species. How did you become interested in ecology and plant science? I always liked learning about plant and animals. I grew up in Milagro in the coast region of Ecuador. It is in a small city with very fertile soil surrounded by ornamental plants and tropical fruits. I started learning about them as a child, but my strongest motivation for getting involved in plant sciences was the lack of programs and people working to preserve the natural resources and diversity of species in my country. Where did you do your undergraduate study before coming to the University of Florida? I studied at Escuela Superior Politecnica del Litoral (ESPOL), which I am proud to say is the best ranked university in Ecuador. Why did you choose to do your master’s in plant restoration and conservation? I chose this program to learn different techniques and procedures that I can practice in the U.S. as well as in my country and to contribute to the preservation of plant diversity. It is my small contribution to the Earth. What is your experience with Florida native plants? In 2015, I worked on seed germination tests of the Okeechobee gourd. Explain your project and its goals. The name of the project is “Germination ecology and seed desiccation tolerance of Linum arenicola.” In my study, I intend to show that seeds of Linum arenicola (Small) H.J.P Winkler display differential germination dynamics based on habitat and temperature, can form soil seed banks, and tolerate extreme abiotic stress. How did you decide that you’d like this to be your focus? Every project that is related to the preservation of species is worth investigating. I can apply all of the knowledge I will acquire to conservation projects in my country, which really needs it. Will your work include field studies, lab work or both? I have started with some preliminary germination studies in the laboratory in Gainesville. I will also set up some field experiments in areas of Miami Dade County where Linum arenicola occurs. Who do you think will benefit from your research? The State of Florida will benefit since this species is endemic to and endangered in Florida. Other researchers that require more information about this species can apply my methodology to their experiments. My country and I will benefit because I will be able to use the knowledge and experience acquired during my research project when I go back to Ecuador. What is your dream job when you finish your education? I want to lead conservation projects for endangered species in my country, and even other countries that want to elaborate strategies to avoid diminishing the very unique species that require urgent research before they go extinct. Do you have any other comments or experiences you’d like to share with Florida Wildflower Foundation members? I would say that it is good to emphasize through social media the importance of every native plant because people usually ask me if the use of the plant that I am working on is medicinal or edible. Some people think that only the food crops are important and do not take a moment to think that every species in nature has a role and the loss of diversity affects other plants, insects and animal communities. For more information on Sand flax, read “Report on the Status of Sand Flax Linum arenicola In the Florida Keys” by Stephen Hodge.